I went down to La Ruta Natural, one of the local techno and electronic specialty stores in Barcelona a week or so ago and the scene wasn’t good. The proprietor has been living in the back of the store for over a year or so now, having converted a small storage space with a little bathroom and toilet into a bedsit with a bed on a raised platform to save money. Now he was having a sale where you could get 10 vinyls for €50, all back stock except for new releases. Problem was he didn’t have new releases. His buying power had fallen so short he couldn’t make an order yet this year. Some cash from the fire sale meant he might be able to get in some new stuff in March, but meanwhile the belt tightens. I picked up mostly dubstep stuff for some reason, with a few singles from Bristol’s Immerse Records label among the highlights. Many of course know the label for the slippery and sinister productions of Russian producer Kontext, but the rest of the label is sometimes overlooked despite having some interesting releases. Down at la Ruta Natural I picked up a single by Planas from 2010. “Look into my eyes” is heavy and traditional, but nonetheless highlighting one of the labels signatures which is quality sound design. One of my favourite releases from the label was Late and his “Phantom Papers” ep also from two years ago which I reviewed for Resident Advisor. Changing subjects: National newspaper El Pais recently published an article announcing that Barcelona’s grand opera house The Liceu was to close its doors for two months this year, in March-April and in June-July resulting in the cancelation of seven shows, including four operas and the Ballet of Monte Carlo. The crisis has caused a 31% decrease in patronage in three years while government cuts to Culture departments have meant a deficit of funds. Only the regional Catalan government has maintained funding. 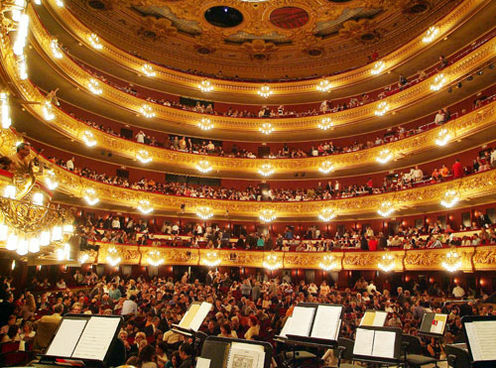 However, there is also a certain criticism of the management style of the Liceu which has favoured a more elitist programming and ticketing strategy and thereby alienated casual goers and tourists. This is perhaps not surprising given the important historical status of the Liceu in Catalan culture and its function as a national theatre. On the other hand the smaller but similarly-positioned Palau de la Musica has found the goings slightly easier due in part to the smaller size, but also due to the more varied and modern programing. Only this week Michael Nyman played there and Philip Glass will play “Einstein on the Beach” there in April. My friend did go to see Jean Michel Jarre perform “Oxygene” live at the Liceu a few years ago, but concerts like that are few and far between. Palau de la Musica was built in 1908 to the designs of Lluís Domènech i Montane and is one of the most emblematic buildings of the fin de siècle Modernista movement running rampant in Barcelona at the time, an organic style that was to represent the most fecund days of Catalan optimism culminating in the two brief Catalan Republics before the Civil War, in 1931 and 1934. 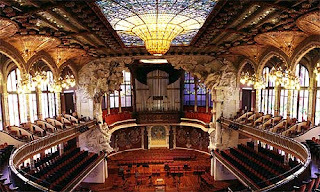 However, Palau de la Musica has not been without its share of financial woe, but at the other end of the scale with a scandal of fraud and corruption. An article from Le Monde even highlighted the trend for this sort of decay in Catalonia in this 2009 article (in English) . The history of the Liceu (Lyceum) opera house extends back further, with the first built on the Las Ramblas site in 1847 and entirely funded by private contributors instead of the Royal Family as is usually the case in Europe and thus already signalling a sense of Catalan independentism. However, the original building was badly burned in 1861 and subsequently rebuilt. In 1994 the building was once more burned catching fire by accident during some repairs and was reopened again in 1999. But perhaps the most significant moment came in 1893 on opening night of the season when anarchists lead by Santiago Salvador threw two bombs into the crowd. Only one exploded, but 20 people were killed (shown here in an unknown film in Spanish). The underlying social turbulence behind the bombing eventually gave rise to the Civil War where Barcelona in particular resisted the longest, despite at times fighting against itself as anarchist and socialists canvased for support, while the socialists themselves eventually split over whether to stage the revolution or the war against Franco first. The subject of the bombing was recently turned into a film “Bomba del Liceu” (The Liceu Bomb). Last year also saw the release of another related film entitled “Catalunya Über Alles” about the subject of Catalan nationalism seen from three different points of view (trailer in Catalan with subtitles in Spanish). It is likely that some of the angst in the film comes in the wake of recent racial controversies from members of the now ruling Partido Popular (PP; Peoples Party) in the Barcelona municipality of Badalona in 2010, where PP politicians distributed anti-Gypsy pamphlets. The song in the background of the trailer is of course a Catalan cover version of the Dead Kennedys classic “California Über Alles” from 1979 (live here with Spanish subtitles). Click here for a recent New Yorker article (in English) that discusses Catalan culture and cinema. Finally, in these times and this context, one cannot go past George Orwell’s “Homage to Catalonia” for a little close up of socialism and anarchism in Barcelona during the civil war. Barcelona people know there is a square named after him in the lower gothic district whose nickname is “Plaça del tripi” (Trippy Square) for all the derelicts and junkies who used to hang out there before the police came in and cleaned it up. George also gets a mention in the Dead Kennedy's song too. Changing subjects again: The Guardian also reported last week that sales of music magazines had once again declined. Uncut was the worst off with Mojo coming out best. Guitar magazine Kerrang! seems a relatively steady ship, but it is clear that nobody is buying magazines anymore. You don’t even need them for the CDs it seems with so many podcasts around. No information is available for The Wire which is an independent operation, but it would be interesting to see how falls correlate with content. In this context, The Guardian also published today an opinion piece on the possible decline of the NME as it approaches its 60th birthday. Personally, the written style of the magazine was always a barrier, forever needing to resort to in-jokes and a certain distancing-condescending treatment of the audience? Relevant? Survival will be the judge.